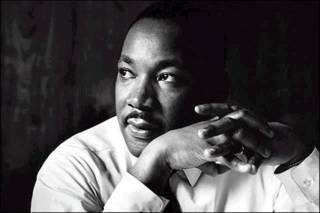 "I have a dream that one day this nation will rise up and live out the true meaning of its creed: "We hold these truths to be self-evident: that all men are created equal." I have a dream that one day on the red hills of Georgia the sons of former slaves and the sons of former slaveowners will be able to sit down together at a table of brotherhood. I have a dream that one day even the state of Mississippi, a desert state, sweltering with the heat of injustice and oppression, will be transformed into an oasis of freedom and justice. I have a dream that my four children will one day live in a nation where they will not be judged by the color of their skin but by the content of their character. I have a dream today. "Sooner or later all the people of the world will have to discover a way to live together in peace and thereby transform this pending cosmic elegy into a creative psalm of brotherhood. I refuse to accept the view that mankind is so tragically bound to the starless midnight of racism and war that the bright daybreak of peace and brotherhood can never become a reality. This is why right temporarily defeated is stronger than evil triumphant."